Center Steven Stamkos skates with Lightning; nears return? Tampa Bay center Steven Stamkos, out since Nov. 11, hopes to play for the Lightning before representing Canada in next month's Olympics. 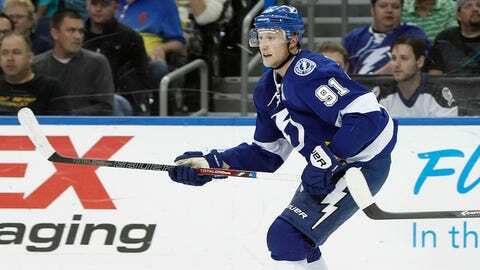 TAMPA, Fla. (AP) — Tampa Bay Lightning star Steven Stamkos has taken another step forward in his comeback from a broken right shin by taking part in his first morning skate. Stamkos practiced with his teammates on Thursday as they prepared for a game Thursday night against the New York Islanders. The center had been skating on his own, or briefly joining the team on the ice at the end of workouts. "It’s not a full practice, but to be able to get out and not have to go off early or not have to wait until the end to go on, I wanted to go and try it," Stamkos said. "It’s the best it’s felt." Stamkos has been out since he was injured Nov. 11 at Boston and needed surgery. "A lot of this is physical and how you feel," Stamkos said. "But there is that mental element. The power of the mind is very strong and I’ve really come to understand that right now. This is another step closer." Stamkos had 14 goals and 23 points in 17 games before the injury. "Every day he’s getting closer," Lightning coach Jon Copper said.